On 15 May 1855, £14,000 of gold bars and coins was sent from London Bridge Station, bound for Paris via the South Eastern Railway. Also on board the train were the experienced thief, Edward Agar, and William Pierce, a former railway employee sacked for petty theft. Pierce wore a wig and false beard so that none of his former colleagues would recognize him. 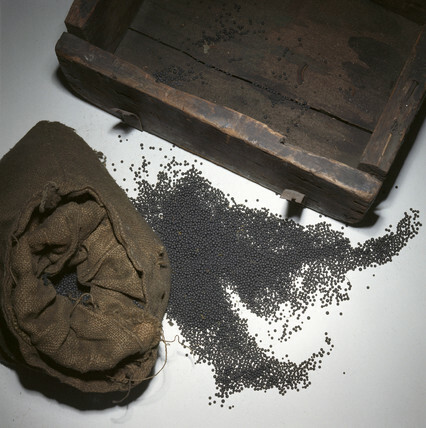 The usual method of transporting gold was to place it in a heavy wooden box, bound with metal hoops. This was sealed by railway employees and then weighed. When it arrived at Boulogne it would be weighed again before being sent on to its final destination. On this day both men carried several satchels filled with lead shot to the exact weight of the gold shipment. They also carried instruments to break open the metal hoops and then reseal them. As soon as the train set off the two men made their way to the guard’s van where the gold was stored. Waiting for them was James Burgess, a guard whom they had bribed. While Burgess kept watch, Agar broke into the boxes, removing the gold and replacing it with lead before resealing the hoops. When the train pulled into Redhill Station in Sussex, Agar took the opportunity to stretch his legs and to hand over two satchels of gold to William Tester, a corrupt railway official. When the train continued its journey Agar, Pierce and Burgess went to work on the remaining gold, swapping it for lead. The thieves had not brought enough lead shot to cover all the gold but took all the gold anyway. When the train pulled into Dover the thieves got off the train and waited for the porter to deliver their booty before returning to London. The “gold” was transferred to Boulogne where it was weighed and continued its journey to Paris where the theft was discovered the next day. The French police said that the theft had happened in England while the English police were convinced it had happened on the other side of the Channel. Meanwhile, Agar and Pierce began the task of melting down the gold and selling it. They then split their loot four ways. The case may never have been solved if not for Agar’s libido. He began the seduction of another thief’s mistress and the thief framed Agar on forgery charges in August 1855. Agar was sentenced for penal transportation to Australia for life. Awaiting his fate, he wrote to his girlfriend, Fanny Kay, to tell her that she was owed £7,000 by William Pierce but she had received nothing. When Agar learned that he had been double-crossed he informed on his fellow thieves.